Pomegranate is tagged as a superfood because of its numerous health benefits and its healing wonders. The fruit, which is native to Iran and other Mediterranean countries, contain anti-oxidants, vitamin C, polyphenols and isoflavones. The fruit, juice, rind, bark, seeds and root can be used in many ways. Many people take pomegranate supplements, drink pomegranate juice and add pomegranate to their salads and other dishes. However, according to study conducted by a team of researchers from the University of Sydney, pomegranate has been found to interfere with certain drugs. Pomegranate contains three major bioactive components, gallic acid, oleanolic acid and ursolic acid. Scientifically known as Punica granatum, pomegranate has possible anti-diabetic properties. It is possible that the fruit’s components can possibly interfere with certain drugs due to competition with transport proteins. According to the study’s co-author and correspondence, Dr. Fanfan Zhou, more emphasis should be given on the possible interactions of food with drugs and medicines. Furthermore, Dr. Zhou believes that further studies should be conducted to better understand the relationship and interactions. Solute carrier (SLC) transporters are mainly responsible in the movement and absorption of chemicals, such as pharmaceutical agents, within the cells, tissues, and organs. They are also responsible in eliminating these chemicals from the body. Based on the study, it was found that gallic acid and ursolic acid have certain effects in the transporters’ processes. These two compounds were found to have inhibitory effects on particular transporters. The chemicals in pomegranate particularly inhibit anti-cancer drugs, such as methotrexate and paclitaxel, and statins for heart disease. Apart from anti-cancer drugs and statins, pomegranate can also interact with ACE inhibitors, namely, Benazepril, Captopril, Enalapril, Fosinopril, Lisinopril and Ramipril. Both have the same effects so taking them at the same time may heighten the effects of the drug. Pomegranate juice helps lower blood pressure levels; therefore, taking anti-hypertensive drugs with the juice can drop blood pressure really low. One reported case involved a man who took 200 ml of pomegranate juice weekly with a statin known as rosuvastatin. The long term effect led to the development of rhabdomyolysis. The condition results to kidney damage secondary to break down of muscle tissue. Pomegranate can also heighten the effects of blood thinners like warfarin. Taking them together can increase the risk of bleeding because they both exhibit similar effects. Although some of these effects still need further studies, it would be best to discuss it with your doctor just be on the safe side. 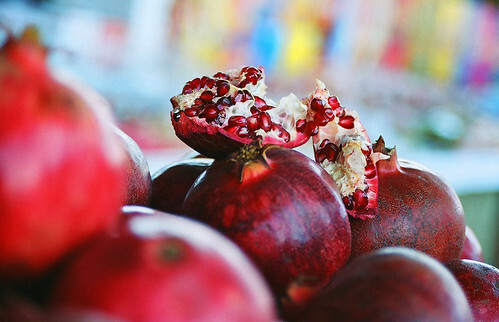 The study on pomegranate is actually first of its kind. It does not matter how you take pomegranate into your system. Whether you take it in tablet, powder, fresh or in juice form, the results still remain the same. Due to the revealing results of the study, Dr. Zhou thinks more studies should be done on other foods and herbs as well. The interactions between herbal and Chinese medicines with pharmaceutical drugs should definitely be looked into. This is an important breakthrough especially in Asian countries where taking herbal supplements and Chinese medicines are very common and popular.